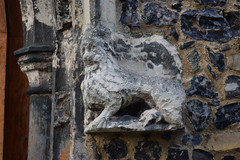 The St Helen's area of Ipswich lies to the north-east of the town centre, and it was an industrial suburb outside the town walls from the early medieval period onwards. 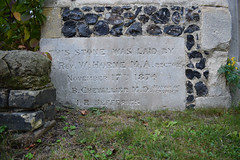 By the 19th Century, the tightly packed terraced streets and small factories made this one of Ipswich's slum areas, and the blackened stonework and eroded headstones of St Helen are still there as a testimony to this period. 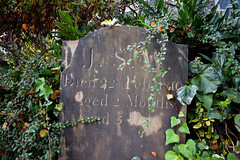 There was considerable slum clearance after the Second World War, although this is still a poor inner-city area. 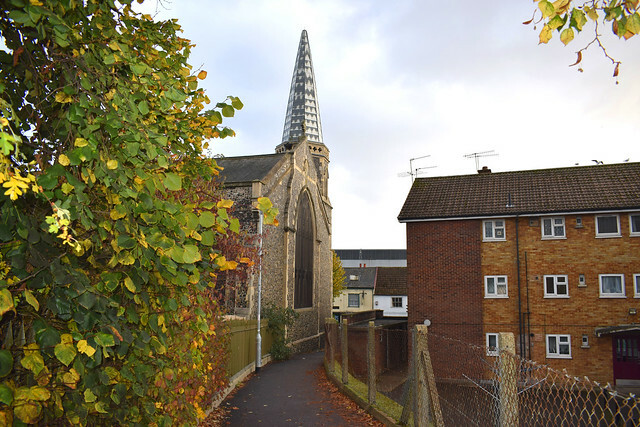 The parish church of St Helen is usually dismissed as being of no interest, and perhaps the stubby little Victorian spire, since rebuilt, does not inspire excitement. 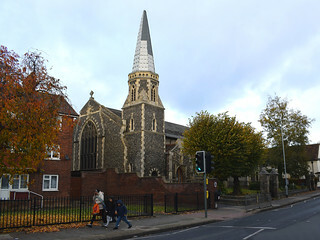 The church was built on the site of its medieval predecessor in several campaigns between the 1830s and the 1870s, the last date being a rebuilding of the nave in a Perpendicular style. 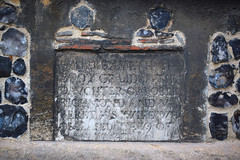 There is a memorial stone recalling the nave rebuilding in the south-west corner, facing St Helen's Street. 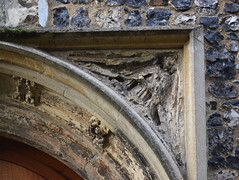 The 15th century porch of the former church was retained. 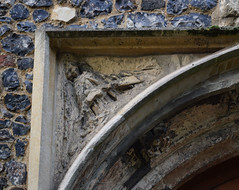 This is not one of the best of its kind in Suffolk by any means, but the angels holding scrolls in the spandrels and lions flanking the doorway are a reminder of the glories of the medieval church, and add a nice touch of continuity. St Helen is kept locked, and is not considered significant enough to take part in Heritage Open Days or Historic Churches bike rides. 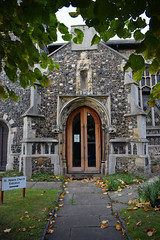 However, this is a church worth seeing inside if you can, for it has been completely modernised, in a most unusual way. Firstly, a huge gallery has been built over what was the chancel arch. This houses storage space now, but may have been intended as an organ gallery. You step beneath it, through into a large, modern space, the former chancel. This room is used regularly for meetings, playgroups, and so on. The 19th century east window survives. Beyond, the nave is carpeted, and a small table altar has been set towards the north wall, turning the orientation of the church 90 degrees anti-clockwise, and doing away with the eastwards position. I took the following photographs in 1999. Among the fixtures and fittings there is no trace of anything before, say, 1970. The Victorian windows sulk in the walls - they know they're not wanted here. As for the porch, well, you can imagine that it must feel quite uncomfortable about what is going on behind its back. But it is all done well, and here is a faith community reordering its church to suit its liturgical requirements, as the English Church has always done, whether Catholic before the Reformation or Protestant afterwards. And when I came here in 1999 the people here were warm, friendly and let me look wherever I wanted. The district of St Helen's is now a largely Bengali area, and the Asian shops add a hint of the exotic to the setting.